Why is the water not clearing? For some reason the water all along Chesil Beach remains coloured. It is not heavily coloured, it has a milky look to it, which is not good for Plaice fishing. I travelled up and down the beach, to try and find an area that might be causing the water to stay coloured, but apart from Chesil Cove being more coloured than usual, I can’t find the source. It could be caused by areas where the pebbles have been removed, leaving patches of easily disturbed sea bed. Every time the tide flows hard over these patches, it may be disturbing sediment! Lets hope not. The next few days of steady easterly winds should make the beach calm, so hopefully it will drop the colour soon. I managed to get out with my mate Paul on his new boat during the week. I wanted to see if I could get a Thornback from Portland Harbour, as I was fairly certain that they would be in there now. 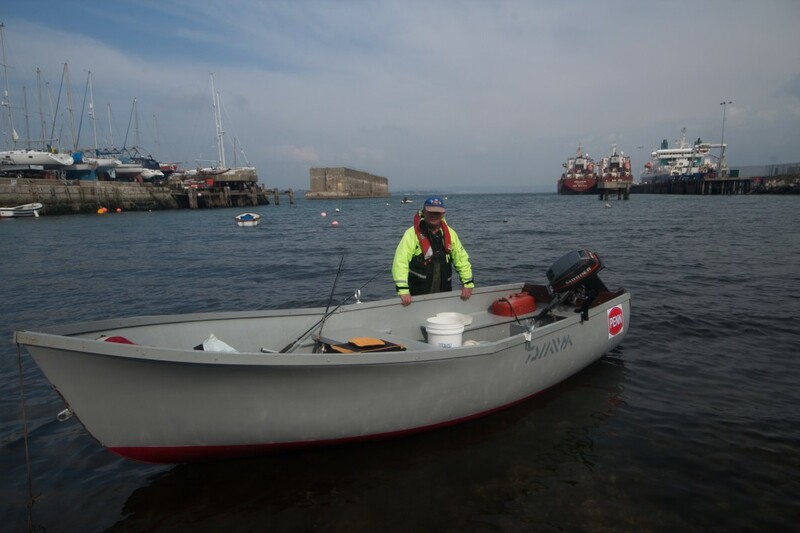 You don’t need a big boat to have fun fishing areas like Portland Harbour. You can get to all the different marks in a short space of time. The harbour can produce a huge variety of fish throughout the year. Our target was Thornbacks and Pollock. Though we didn’t manage any Pollock, we did see a few other small boats land a few. They were mostly around the 2lb mark, but great fun on light tackle. I wont lie, it was not the most frantic session I have had in the harbour. We moved around a lot to try and locate the fish. We were plauged by small Whiting, but we eventually managed to find a Ray. Only a small one, but I am confident that the next time I go I can find them pretty quickly. I have been out every day for the past two weeks looking for the Thin Lipped Mullet that normally show by now. I have not seen a single one in any of the harbours. I had a report from a diver that they had arrived in Portland Harbour, and I have seen a few Thick Lipped Mullet caught, but none of my favourite early season Thin Lipped. Weymouth Bay: 1m surf going out about 70yds, with lightly coloured water. 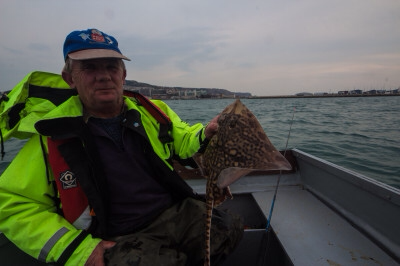 Chesil Beach forecast: If the water clears and it is looking likely that it will get better over the next day or two, then there is a good chance that anglers will be able to connect with the Plaice. If it doesn’t then I am affraid it will be pin Whiting, Pout, Rockling and Dogfish. It won’t be long before the Mackerel shoals are in. It is well worth whilst giving it a go with some feathers. The early Mackerel shoals are often accompanied by Herring. You can get them on normal Mackerel feathers, but using small Hokias gives you a far better chance. Portland: With building tides and sunset coinciding with 2 hours either side of high water, there is a great chance of catching Pollock on lures from all over the Island. Although the water is still fairly coloured, It is clear enough for any Wrasse that around to feed. You can target them with soft plastic lures such as Xlayer’s but at this time of year you will have a lot more success with Ragworm. Portland Harbour: As you read earlier, there are Rays in the harbour. These are difficult to catch from the shore, as they don’t seem to come any shallower than 5m. There are one or two places in the harbour that is possible,unless you are one of the lucky ones that can fish from the Marina walls. Small boat fishing can be very good in the harbour, with numerous spots to try for Wrasse, Pollock and Rays. Weymouth Bay: With a nice surf running along Preston Beach and into Bowleaze there is always a chance of an early Bass. Flounder are still prolific in patches along Preston. More species will start to appear from the piers in the next couple of weeks, and the Mullet will arrive any minute. Fishing Tails > All Articles > Reports > Chesil Beach > Why is the water not clearing? 3 Responses to "Why is the water not clearing?" I’ve been working near Weymouth harbour and have seen a few over the last few weeks. Mostly from the walkway that divides the harbour and the river. Looks like I will have to go and have another look and take my rod with me.